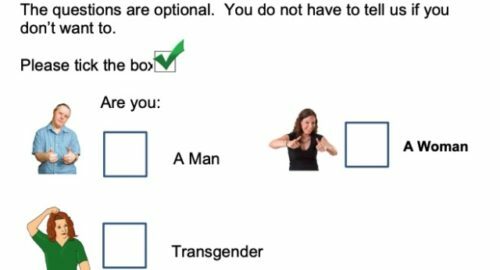 A municipal government has come under fire for posting an online survey that had a strange image in it meant to depict transgender people. The Essex County Council in the UK posted a survey about library services to its website. By separating “transgender” from “man” and “woman,” the survey appears to imply that trans women are not really women and trans men are not really men. The images chosen to accompany the question didn’t help either. “A Man” and “A woman” are illustrated with photos of a white man and a white woman giving a double thumbs-up. Related: MSNBC hosts panel on transgender invisibility. Forgets actual trans people. “Transgender,” though, is accompanied by a drawing of a white person removing a wig. This depiction plays into the myth that transgender people are just pretending to be a gender for a while, something they later take off. Also, the double thumbs-up for men and women isn’t repeated for the transgender image. A spokesperson for the Essex County Council said they are “sorry for any offense caused” and that the image has been removed from the survey. They said that the image was provided by Inspired Services, a company that specializes in making documents easier to read to help people with limited English or learning disabilities. “It feels to me like Essex County Council is not as safe as it should be, because their own consultations are portraying a negative gender stereotype,” she said.